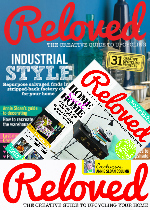 Reducing waste through upcycling, repurposing, refashioning and reloving. Repurpose: Wire hanger toasting forks! Campfires and melting marshmallows = happiness! 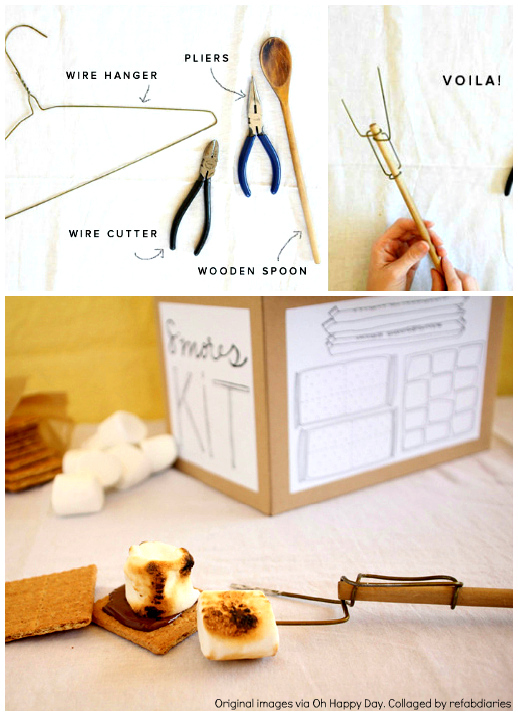 Thanks to Oh Happy Day, you have all the instructions you need for DIY toasting forks (and a complete S'mores Kit - free printable too). The idea is to make the wire forks at home using a wooden spoon for sizing. 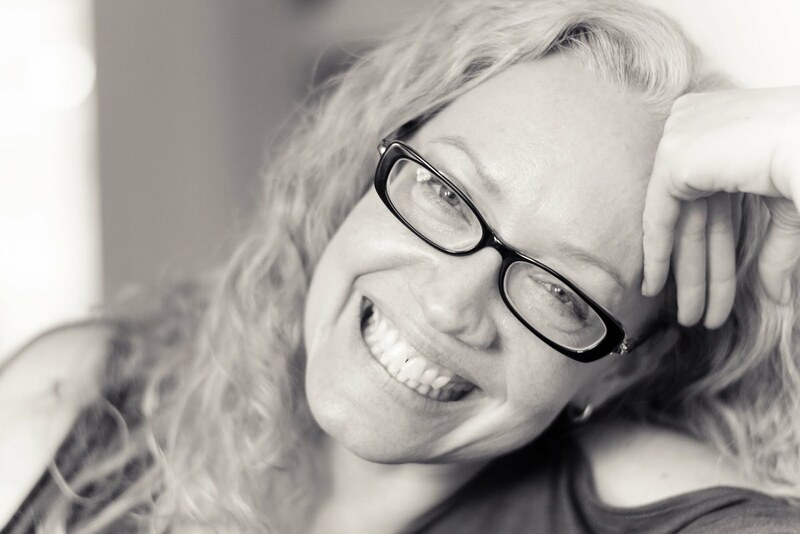 Once at your camp site, you (read: your kids!) hunt down actual sticks/twigs that fit. I few weeks ago I needed to shorten a morning run and turned down a street not usually on my route. Consequently, I discovered this house just a few blocks from me in Rogers Park. I am *not* the first person to put pics of this place online (Apt Therapy 2010) but I couldn't resist going back to photograph it. A cheap, humble raw material. 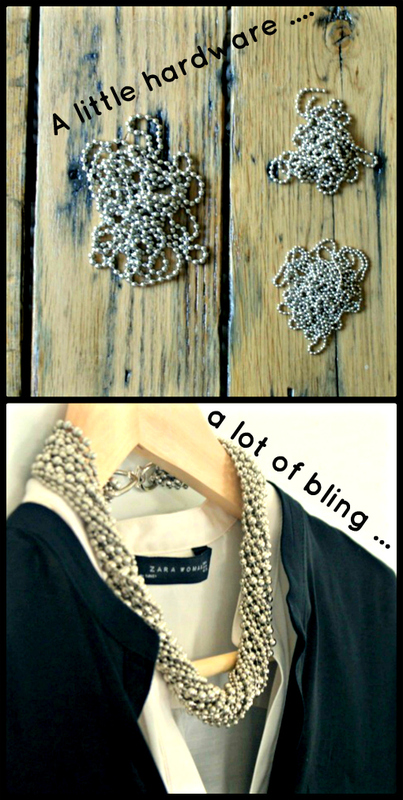 A great little DIY necklace. Care of Dismount Creative. Crafting with bottle caps has been done, done and done. I know. But they (the caps) still accumulate... especially if your preferred beverage comes from a brown bottle. Right? 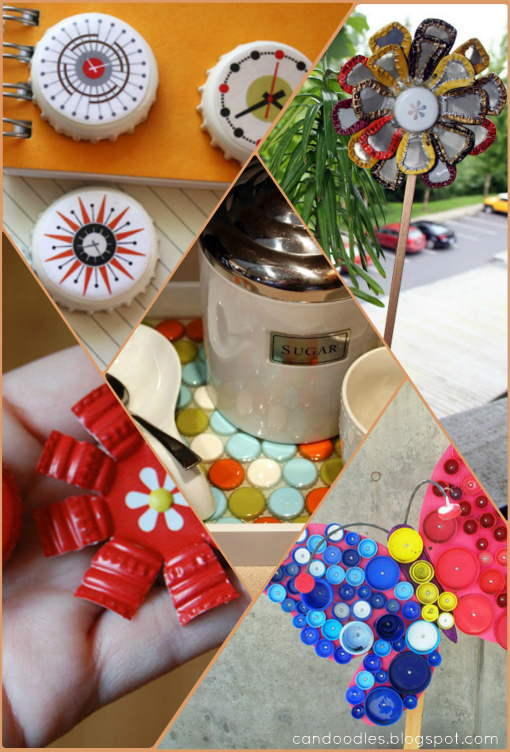 So I am always interested in ways to repurpose them ... and this post focuses on home accessories / decor, v. the many necklace, earring and bracelet options out there. 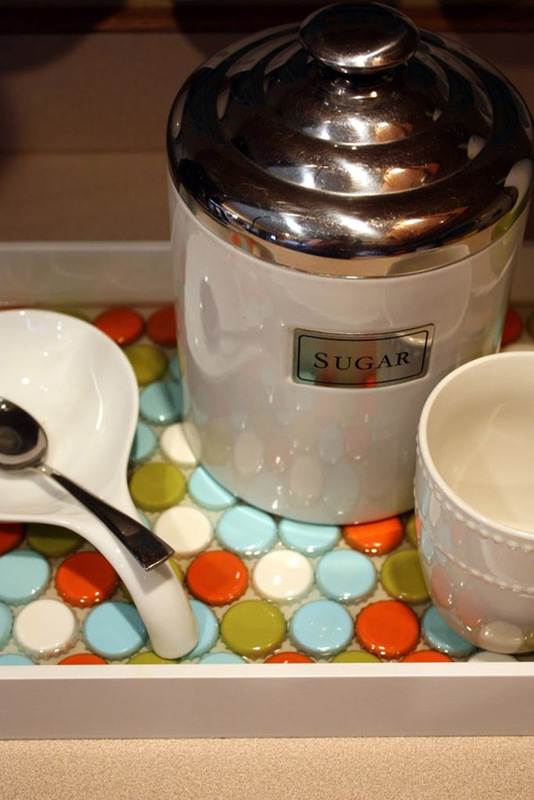 The amazing resin serving tray (above) got this post started. I think it's genius and LOVE the color combination ... great tutorial overall from SomeWhatSimple. 14 more after the jump! 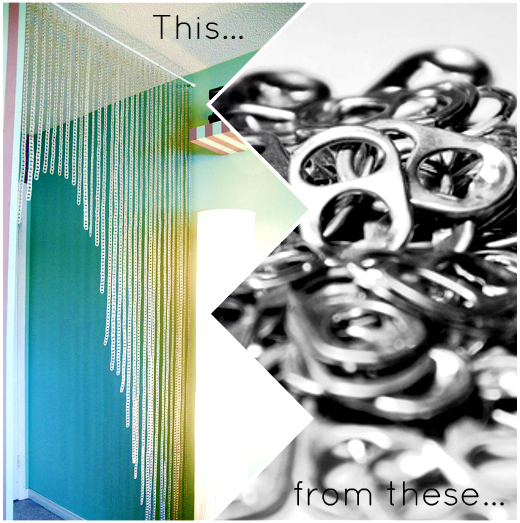 I had a lot of fun putting this post together! 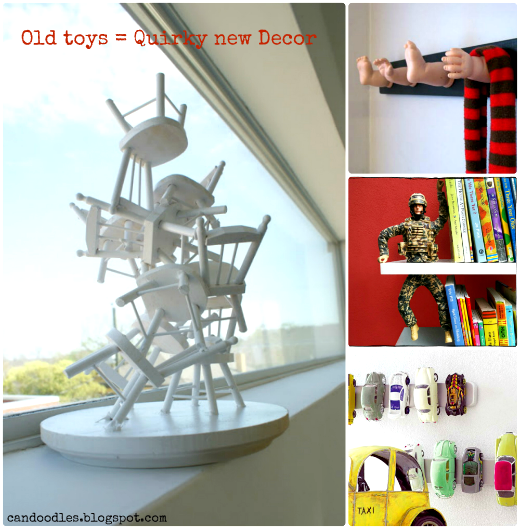 Using old toys as decorative items or home "accessories" requires a certain sense of irony. Definitely a sense of humor. And now that I've joined the ranks of those who trip over toys on a daily basis, I look forward to the day when I can either donate them or cut them into small pieces! For repurposing, of course. Read on for 20+ ideas. 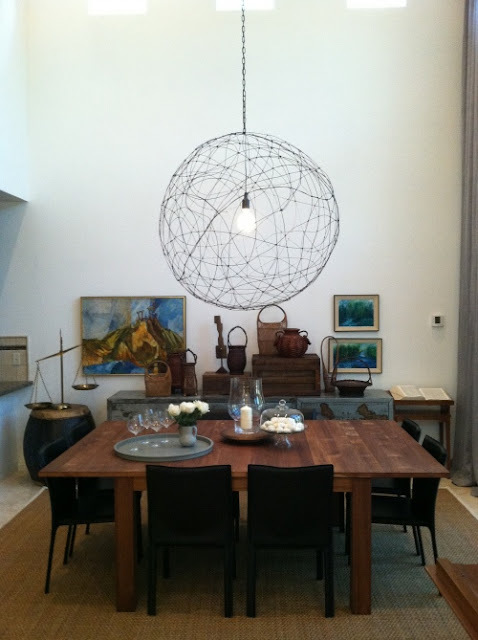 I love Anthropologie - the store designs and overall aesthetic of the buyers. I don't love the non-sale prices. And I don't love the political leanings of the man atop the brand (which includes Free People and Urban Outfitters). I own clearance items purchased with gift cards. More than anything, I get a kick out of "athro-hacking" or "anthro-morphing", if you will. If I can be inspired by (i.e. steal) their ideas and make it myself (or anthro-morph something thrifted), I will. So here's my most recent morph, based on lots of leaf earrings I saw in store a couple of weeks ago. 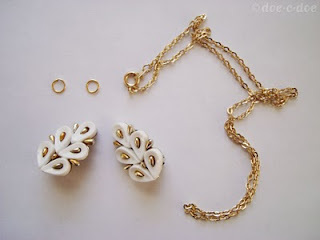 I liked the idea of white (I don't wear gold) ... and I loved the beads down the center of the leaf. Here's my version ... instructions below. The Martha Stewart Weddings blog (Brides Guide) recently mentioned Stringcycle's guitar-string flowers ... they said "we see them fitting into a quirky vintage wedding theme as totally unique table decor". 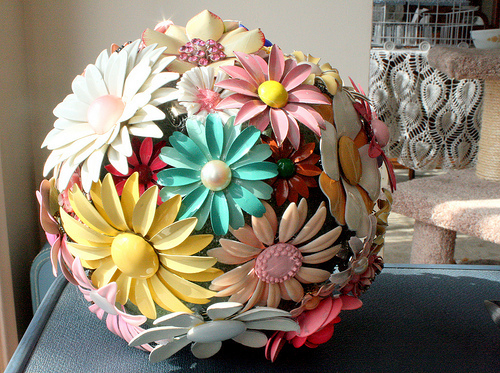 I think fresh-flower alternatives are big for bouquets too ... and this enamel-brooch repurposed wonder deserves a look. It's bold and out there. that allowed her to fly. 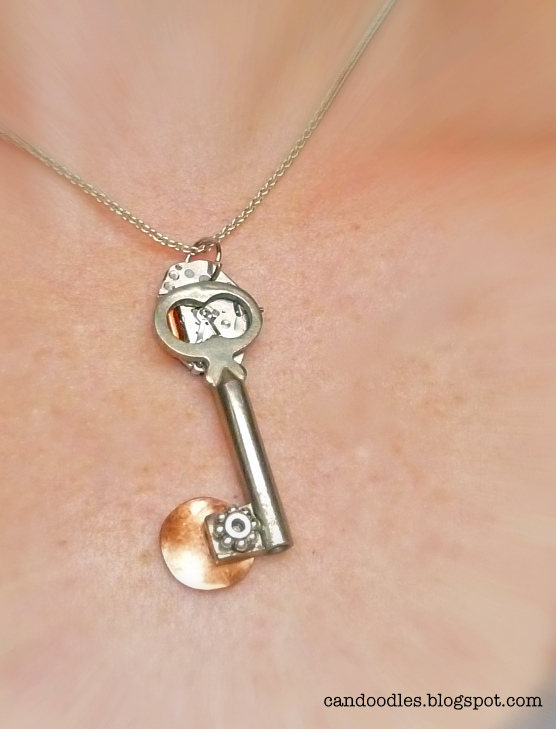 As promised, a little steampunk pendant doodle for you. I made this on a whim, after finding the available tutorials a little thin on the ground. This little key pendant is now, hands down, my favorite piece of jewelry! I started with an old quartz watch and a key I've had lying around for years, waiting for just this moment to shine. And let me say ... I think old keys (especially little ones) are magical all by themselves. I didn't really know where I was going until I opened the watch. I've never taken a watch apart before (I know, I haven't lived, clearly had no childhood etc). And when I saw the mechanism, I felt like a magpie! Much more appealing than I was expecting it to be. 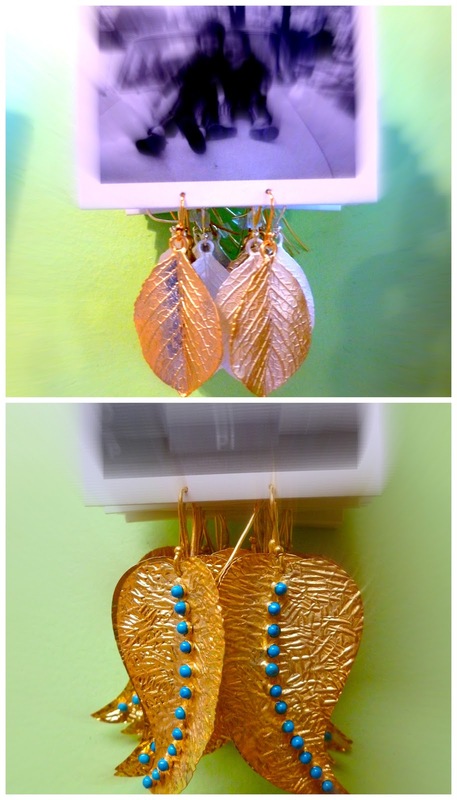 Ingenious jewelry hanger? I think so. It's simple. It's smart. It makes an old wire hanger useful. 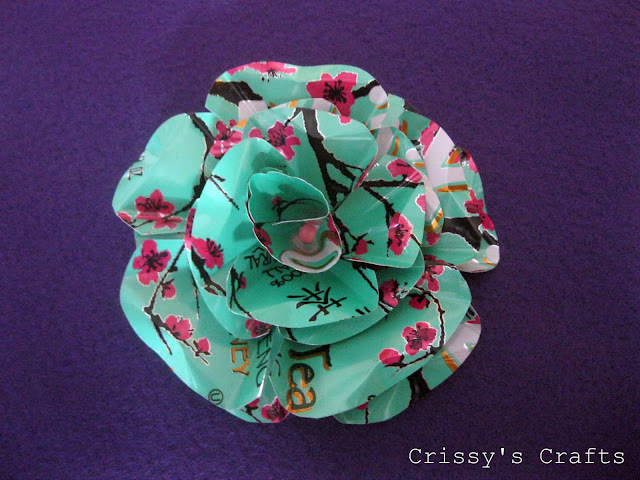 I love it, and it's all I'm featuring today. Get the how-to from The Letter 4. 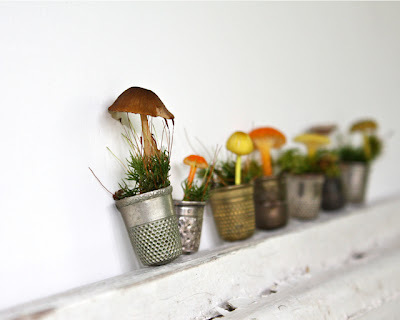 If you're a tiny, imagined being like Arrietty (or any other "Borrower" or "Little"), you trade in thimbles. Really - where would you be without them?? I stumbled upon this pic on Flickr recently and was entranced. So I went hunting for Thimbalina re-do's for you. 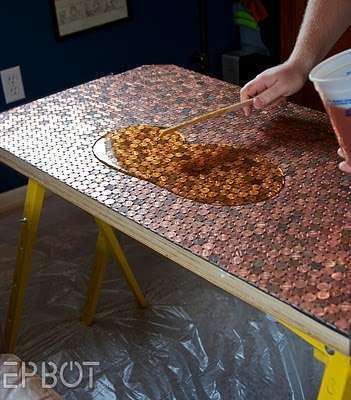 Maybe a desk made of pennies will help generate lots of good, deep thoughts? 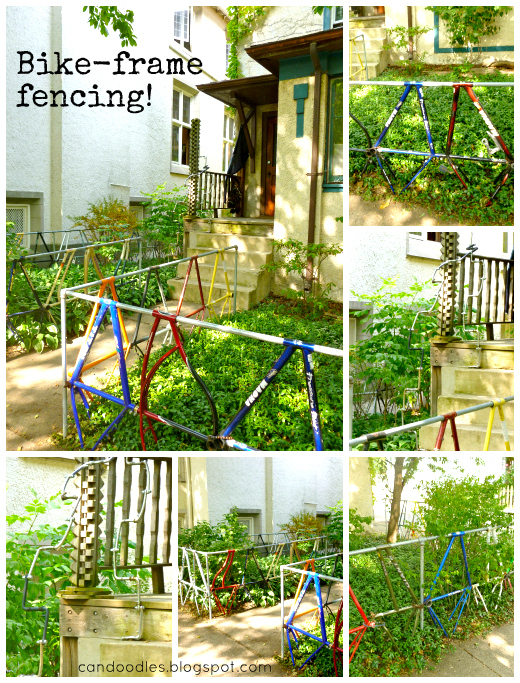 Via ManMade DIY (one of my biggest blog crushes). Great, detailed how-to for these sweet metal flowers ... not designed to be worn so no worries about those edges, except in the making. Mmmm... love this. A little 14 gauge galvanized wire, a little time. Go make it. Perhaps re-purposing etc appeals so much to me because it exposes the hidden potential in ordinary things. You take something mundane and make it a centerpiece. 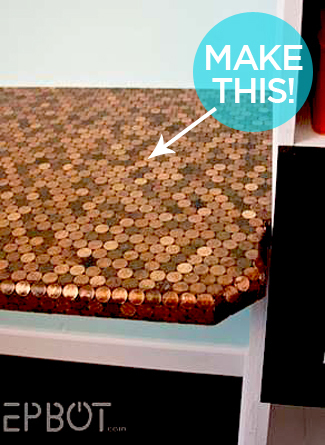 You bring something rough and utilitarian indoors ... smooth the rough edges just a little and give it a second chance. I guess I'm an optimist - I definitely believe in second chances! 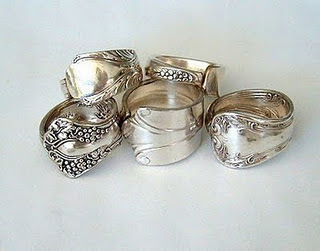 Upcycle: Silverware becomes silver WEAR! Old silverware (or cutlery, where I'm from) is always so eye-catching. They just don't make it like they used to right? So why stick it in a drawer when you can WEAR it? 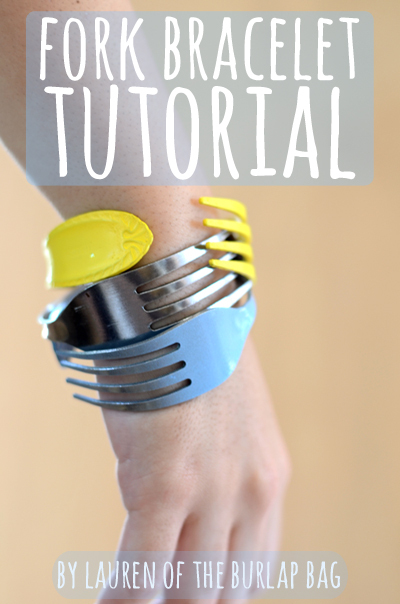 Get ready to cut metal with this great "spoon ring" tutorial from Through the Front Door ... while you're there, check out her round-up of new uses for old silverware! Not really a ring person? 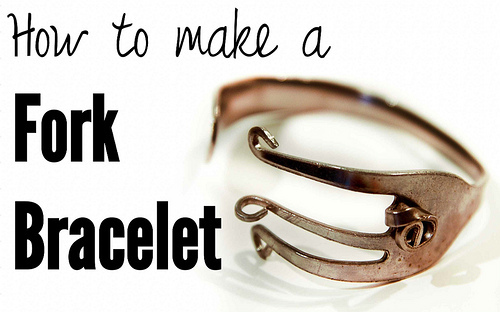 Stars for Streelights shows you how to make a fork bracelet. 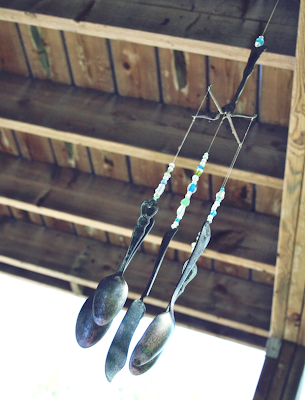 I used to own a beautiful wind-chime made of old spoons and forks ... think I got it in England. 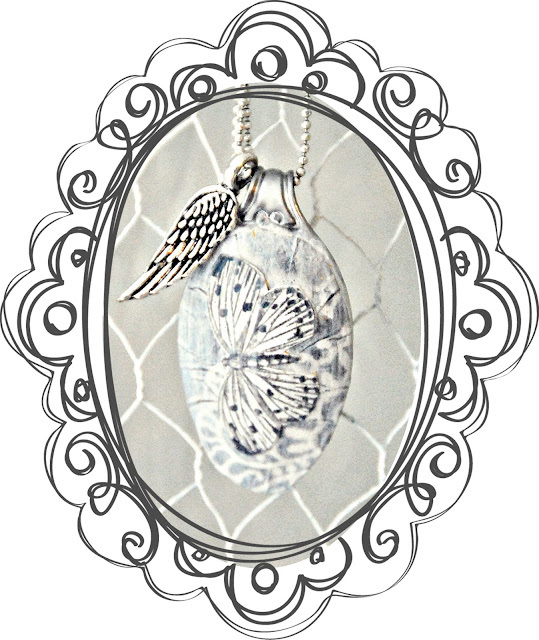 I lost it in a move - I remember it making a really soft, lulling sound in the wind. Tutorial at Freckled Nest. 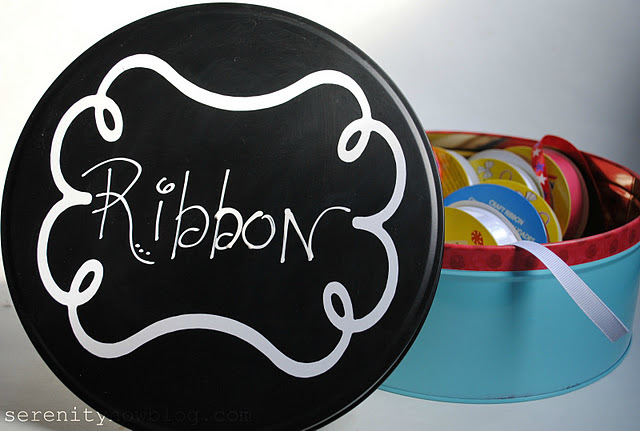 You know you'll be stuck with yet another three snowman/santa/holly bedecked tins come Dec 26. 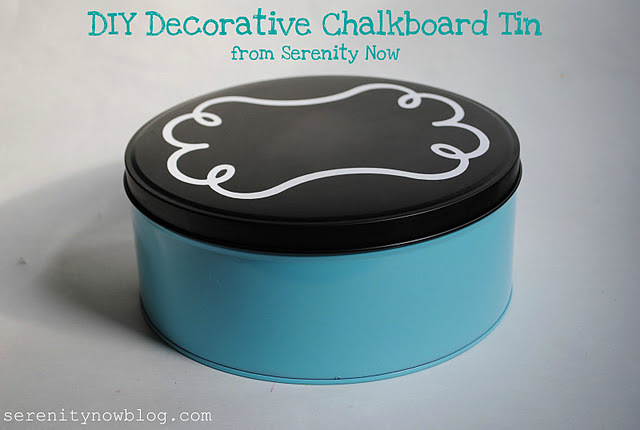 Check out this *great* tutorial from Amanda at Serenity Now and upcycle the suckers! Your kids will love this too. A necklace! 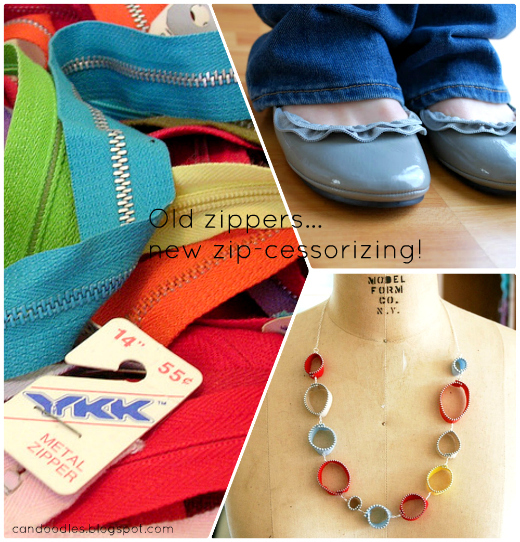 How often do you stand in thrift stores and stare at all those great vintage clip-ons? And then wish you could *somehow* wear them?? You know, in way that wouldn't cut off the circulation in your earlobes? 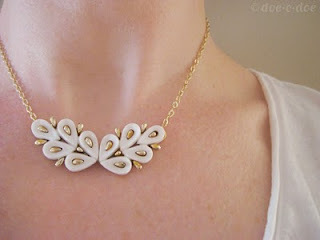 Doe-c-doe makes the conversion of earrings into a necklace look pretty easy. Click on the pic to find out more. 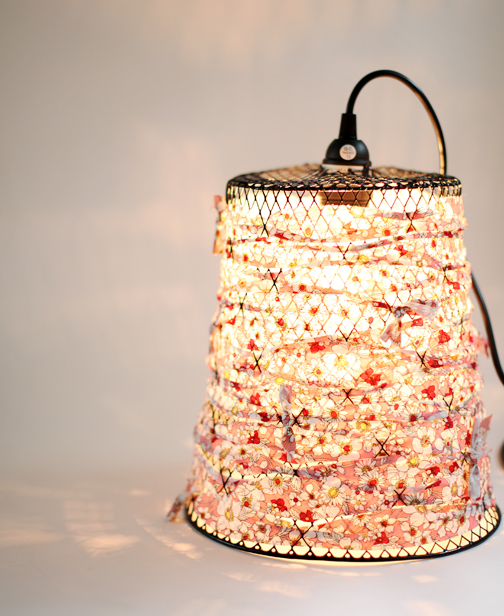 Upcycle: Coke bottles + duct tape = glam lamp! 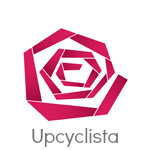 From time to time this blog may generate compensation through free products, sponsorship, advertising/ads and links. Compensation will not, in any way, influence my opinion or content of my posts. I am committed to what I do here and I reserve the right to decline offers of advertising and sponsorships if they are not consistent with the goals and philosophy of this blog and its readers.